Child Seats | Nashville Car Accident Lawyers The Law Offices of John Day, P.C. Contact Tennessee Auto Injury Lawyer The Law Offices of John Day, P.C. Choosing the proper safety restraint for your child can be somewhat confusing. Considerations include age, weight, height, rear-facing, LATCH systems, front seat, back seat, etc. And these issues are incredibly important. 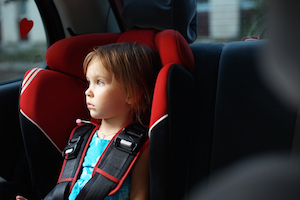 Car accidents continue to be the leading cause of death for children ages 4-14. Below is Tennessee law for child safety seats. Children under one year of age and weighing less than 20 pounds must be secured in a rear-facing child seat. The child seat must meet Federal Motor Vehicle Safety Standards (FMVSS). The safety seat must be secured in the rear seat unless a rear seat is unavailable. If it is unavailable, then the vehicle manufacturer's instructions must be followed. The weight rating on some safety seats permit the child to continue to use the seat in a rear-facing position beyond 20 pounds. This is permissible under Tennessee law as long as the child's weight is under the maximum weight recommended. The law requires rear-facing seats for this age and weight group to protect against brain injuries and spinal column injuries. At this age, children's heads are the heaviest and largest part of their body, which is why we cradle their necks when we carry them. In an accident, the forces can cause the head to whip forward causing serious injuries especially for babies. A rear-facing car seat cradles the head and neck and offers greater protection in most accident types. Once the child reaches age 1 and 20 pounds, the child can use a forward-facing car seat. Again, the car seat must meet FMVSS standards and must be installed in the rear seat if one is available. If no rear seat is available in the vehicle, the car seat must be installed in accordance with the vehicle manufacturer's instructions. A violation of the child safety seat law is a Class C misdemeanor. In addition to fines, anyone found guilty of violating the child safety seat law may be required to attend a court-approved offenders' class offering education on the issue. The offender is responsible for paying for the cost of the class in addition to any fine. All fines are paid into a special fund used to purchase and or loan child safety seats for parents and guardians who are unable to afford them. One final note: if a child is not capable of using a conventional car seat, then a “specially modified, professionally manufactured restraint system” may be used with a physician’s prescription. At The Law Offices of John Day, P.C. we are dedicated to helping injury victims. Our award-winning lawyers offer a free, no-obligation consultation. We handle all injury cases on a contingency basis so we only get paid if we recover money for you. If you would like to talk to one of our attorneys, please call us anytime at 615-742-4880 or toll-free at 866.812.8787.